Kmart will open their doors at 5:00am on Friday morning. “Doorbuster” pricing is from 5-11am. Here is a sneak peak at the Kmart Black Friday Ad. Below are a few of the top deals from their ad. If you are looking for Lego’s this might be one of the places you want to look with their B1G1 50% off sale. 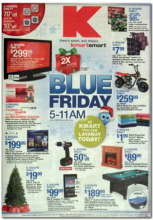 Offers Nov 20, 2011 in BlackFriday, Kmart · Expired! Yes, you are seeing the title correctly. I said it, Double Coupons! Kmart will be doubling unlimited coupons with a face value up to $0.99 each. All you need to do is have an active Shop Your Way Rewards Card. You can sign up now online or at the store. It’s free and took me just a few seconds to sign up online. I was also able to print a temporary card to take with me. Here is a complete list of participating stores. I checked and most of the SF Bay Area locations are participating. The best way to take advantage of this deal is to go through your coupons. Take your high value ones with you, not exceeding $0.99. Also, check the available printable coupons too. Now that you can double, they might be more appealing. You can print from Coupons.com, Coupon Network, and Red Plum. If you are able to get some amazing deals, please come back and share them. Thank you to Julia, The Frugal Find, for sharing this deal! 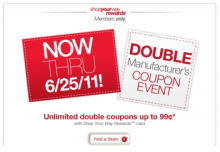 Coupons Jun 18, 2011 in groceries, Kmart · Expired!